Twenty months into the most serious downturn since World War II, the economic mavens have agreed on a name: the Great Recession of 2008. Whatever it is called, this economic has put community colleges in a vise: enrollment is up sharply just as state support declines. Moreover, the community college role of linking students to jobs is undermined as employment dries up in industry after industry. 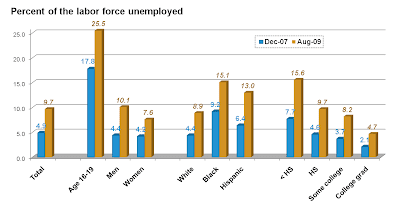 What are the prospects for employment? 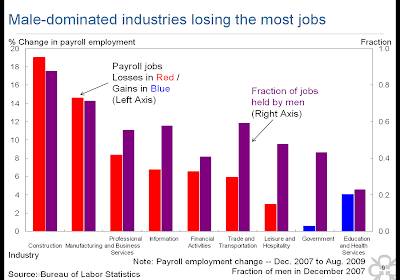 Finally, Groshen documents that male-dominated industries have lost the most jobs with government, education and health the only areas to gain employment since the recession. What will be the affects, then, of the Great Recession of 2008 on community colleges? First, the downturn has exacerbated the funding shortfall for community colleges. Already, some colleges are turning away students as classes fill and others are reducing services to students. As is usual in economic declines, the poor and working-class – in this case community college students – are most affected by cuts in public college funding. Colleges will struggle for some time in trying to serve more students with less governmental support. Second, high and persistent unemployment brings into question the value of particular college programs. Colleges will have to examine program offerings to ensure that education leads to the prospect of decent paying jobs. Colleges will want to align offerings to support local economic development efforts. In this regard, the value of dialogue over economic planning with state and local officials will increase. Finally, the most important affect of the Great Recession of 2008 will be to convince Americans that college is a pre-condition for a decent paying job. The community college role will be permanently enhanced as more and more Americans view them as the portal for obtaining a college credential. STCC is built around a large green that contains numerous deciduous trees. 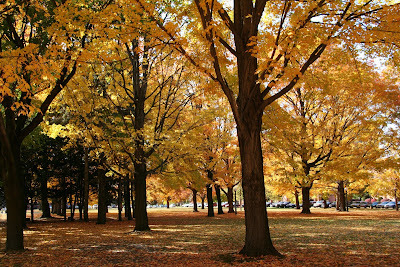 Shown above is a portion of the green with sugar maples in their fall splendor. 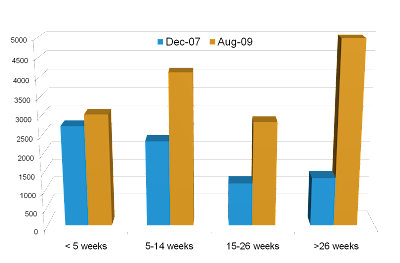 Large transfers into community colleges are counter-intuitive as one would expect students to transfer from them into baccalaureate institutions. This seems to indicate that students are choosing community colleges after trying other alternatives. Friday, October 16th was the 150th anniversary of John Brown’s attack on the federal armory at Harper’s Ferry. To mark this event and explore John Brown’s legacy, STCC organized a symposium on October 17th entitled the Sword of the Lord and of Gideon: John Brown and the Coming of the Civil War. Dinah Mayo-Bobee, Professor of African-American History at the University of Massachusetts Amherst, discussed the controversial Pottawatomie Affair carried out by Brown and his followers in Kansas. David S. Reynolds, author of the best-selling biography, John Brown, Abolitionist: The Man Who Killed Slavery, Sparked the Civil War, and Seeded Civil Rights, described the ways that John Brown has been viewed by historians. John Gately, Professor of English at STCC showed off his impressive collection of documents and artifacts from the abolitionist movement. 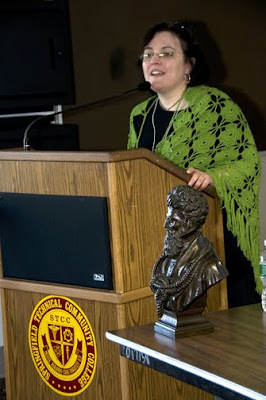 According to STCC Dean Arlene Rodriguez (pictured right), John Brown lived in Springfield from1847 to 1851. The years Brown spent in Springfield are seen by scholars as pivotal to his deepening involvement in the abolitionist movement. In November, 1847, Brown met slavery’s most renowned critic, Frederick Douglass, who interrupted a speaking tour to meet him in Springfield. It was in Springfield in 1851 Brown founded a black self-defense organization – the first in the nation - called the League of Gileadites. Jeff Bigelow, tradesman and Dave Hill, head of the heating/cooling plant, know the value of the college’s new solar trash compactors. 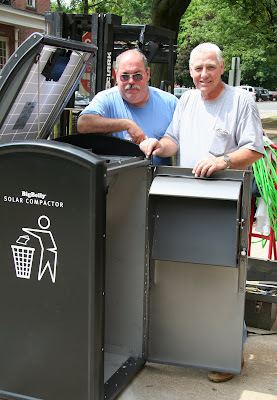 These units scattered around campus serve as places to deposit trash and they use solar power to compact the contents. The result – trash is collected much less frequently and it trash takes up less space. An 85 kilowatt photovoltaic array has been installed on the roof of building twenty. These photovoltaic cells convert solar energy directly into electricity without burning any fuel. Geothermal heating and cooling is part of the renovation of building 11. Two deep wells will deliver 52 Fahrenheit degree water that will cool the building in the summer. During the winter, that same 52 degree water will be heated to provide heating. The circulating water will make the building seem to be in a constant 52 degree environment. When it’s warm, let in some of the cool water; when it’s cold outside, raise the temperature of the building from 52 degrees to 70 degrees. The college is planning a new heating and cooling plant that will also produce electricity. Called co-generation, the facility generates steam that runs electric generators; the heat produced is also used to heat (or cool) the campus. Another feature of this novel project is the fuel – either wood chips or natural gas. Hardwood chips are available in western Massachusetts as a byproduct of lumber harvesting and furniture manufacture. Not only is wood less expensive than oil, but the money to purchase it stays in the local economy. AND wood in a modern heating/cooling plant burns cleaner than oil because it gives off no sulfur or nitrogen gases. Many faculty and staff are excited about making sustainability a core principal of the college. Faculty members are discussing ways to incorporate energy conservation into courses and programs of study. The college is offering training courses on photovoltaic installation and building retrofitting to reduce energy. To lead these efforts STCC has established a Green Energy Council involving faculty, training staff and college facilities personnel. STCC has seen the future and it is green. A recently published book, Crossing the Finish Line: Completing College at America's Public Universities by William G. Bowen, Matthew M. Chingos & Michael S. McPherson lays out a detailed analysis of the stagnation of the US college graduation rate (the first chapter can be accessed at http://press.princeton.edu/chapters/s8971.pdf). Unfortunately, State and federal financial aid has not kept up with college costs and the cost of living for our students. STCC students struggle to juggle studies, jobs and family responsibilities. The majority of our students work more than 15 hours a week – in fact, many are working a full-time. 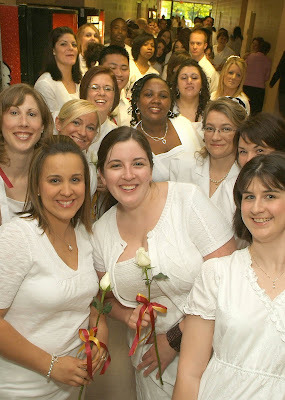 We applaud our students who succeed such as the nursing class of 2009 shown above. But more of our students would graduate if state and national funding reflected President Obama’s goal.